Most people don’t keep a set of mechanic’s tools in their trunk. So when your car won’t start and you get stranded with a dead engine, you feel pretty helpless. But don’t give up right away if your car will not start. We’ve compiled a list of tricks you can try when your car won’t start, and none of them require tools. They’re arranged by symptom, and you’ve got nothing to lose by trying them if the car cranks but won’t start. Of course, they won’t fix the root problem, but one of them just might get the engine started so you can head to the nearest mechanic to have the problem fixed. Here are some things to try if your car won’t turn over. 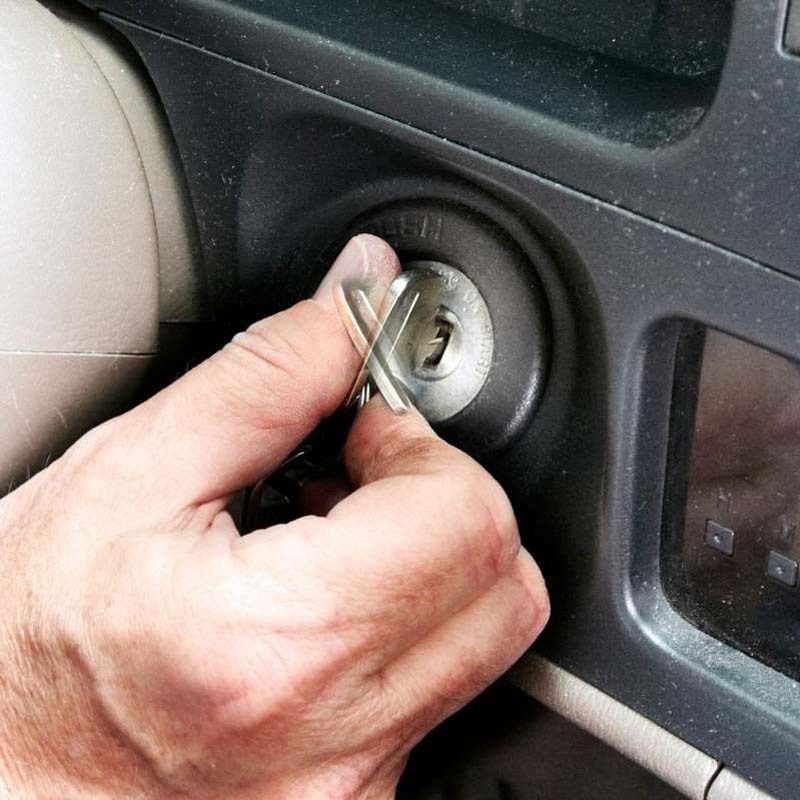 Cycle the Key: If your car turns on but won’t start, turn on the dome light and watch it while you try to start the engine. If the light goes out, it’s a sign the battery is really weak—almost dead. To heat up the battery, terminals and starter, try the “key cycling” trick. The trick is to turn the key to the start position repeatedly about 10 times in a row. Stop and wait five minutes. Then try to start the engine. But if the dome light stayed bright when you turned the key, move on to the next trick if your car won’t start. Tap on the battery terminals: There’s no way to clean corroded battery terminals when you're stranded without tools. But you can try to move or at least jar the terminals enough to make better contact. 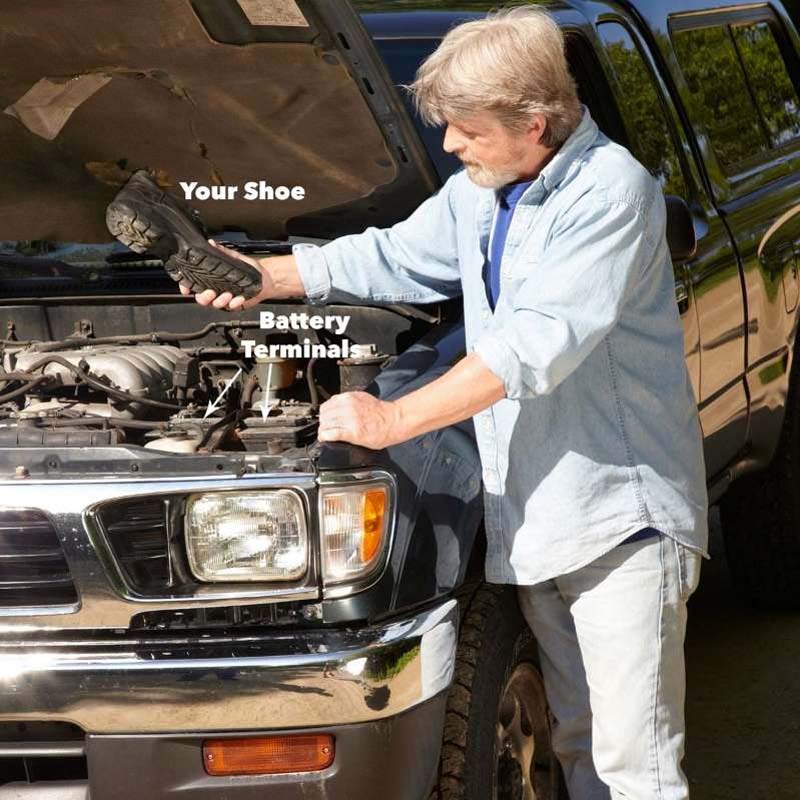 Smack each battery terminal with the heel of a shoe to rotate it slightly around the battery post if the car will not start. Then try starting the engine. Smack the starter: If you have access to the starter motor, try smacking it with the tire iron from your car jack. Sometimes, the electrical contacts get stuck and can be freed by tapping on them. Shift the Shifter: With your foot on the brake, move the shift lever to the neutral position and try starting the engine. If that doesn’t work, move it back to “Park” and try it again. Moving the shifter sometimes reestablishes electrical contact inside the transmission range selector (also known as the neutral safety switch). Swap Relays: With the radio off, turn the key to the “Run” position and listen for a two-second buzzing sound. That’s the fuel pump priming the injection system. If you don’t hear any sound, the fuel pump relay may be bad or the pump may be on its last legs. First, find the location of the fuel pump relay in your owner’s manual or on the legend of the under-hood fuse box cover. Yank the fuel pump relay straight up. 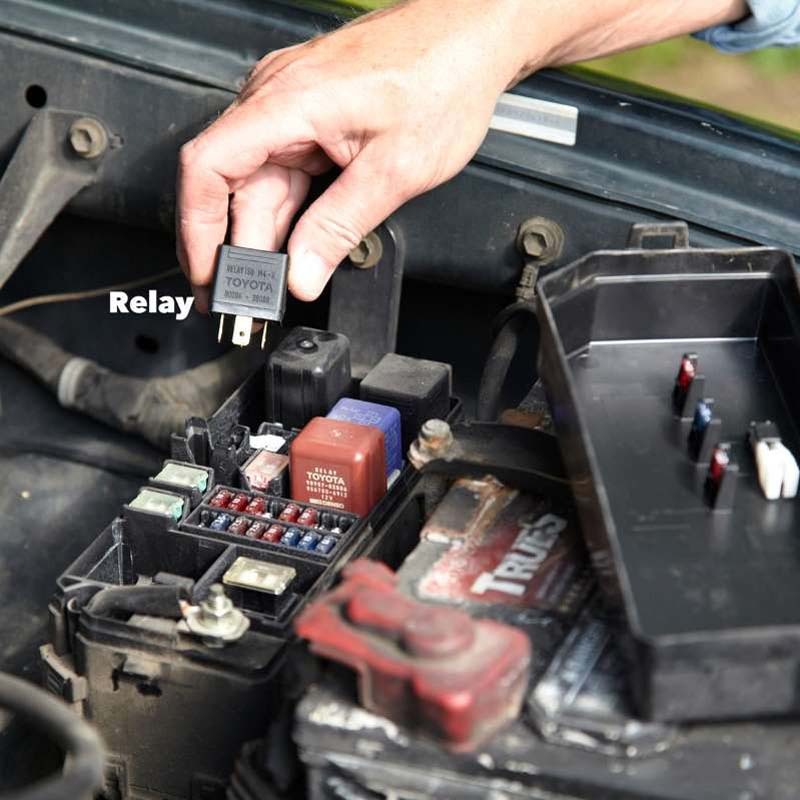 Then locate another relay with the same part number and swap it with the fuel pump push it straight into the socket. Try starting the engine afterward. 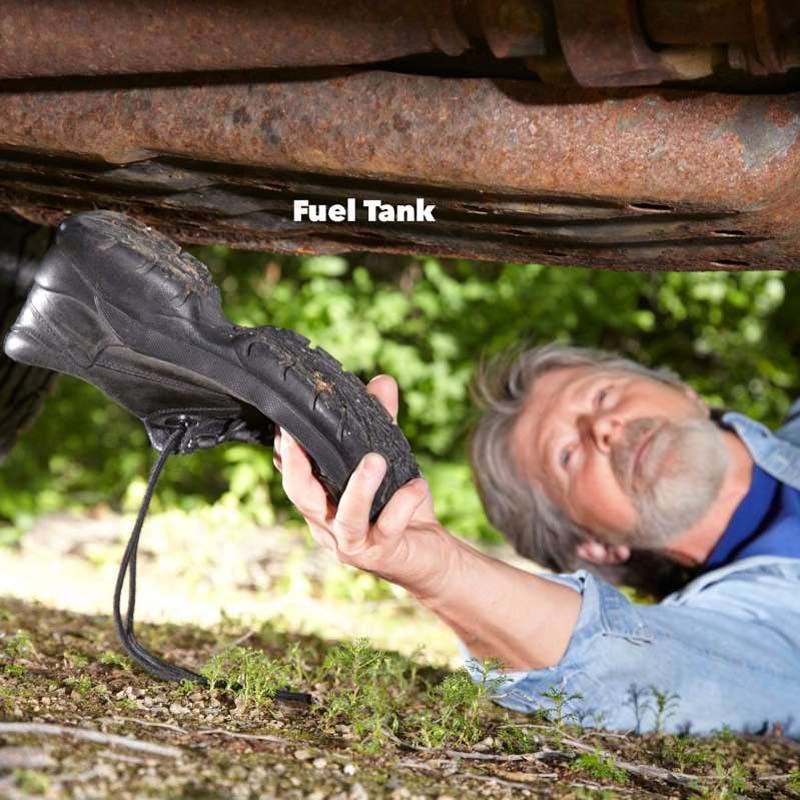 Smack the Fuel Tank: If your car won’t start, hit the bottom of the fuel tank several times with the heel of your shoe to jar the fuel pump motor. Then try starting the vehicle. Un-flood a flooded engine: If you smell gas, the engine is flooded. Press the accelerator pedal to the floor and hold it there while you crank the engine. Trick the computer: A vacuum leak or funky temperature sensor can result in an air/fuel mixture that’s too lean to start a cold engine. If you’ve tried all the other tricks shown here and your car won’t start, press the accelerator halfway and try to start the engine. That’ll tell the computer to add more fuel. Own a Ford? Read This! After he went through all his tips, I asked, “Are there any oddball ones you’ve left out?” “Oh yeah,” Rick said. “Most Fords have an automatic fuel pump shutoff switch to prevent fire if the car’s in an accident. If that’s tripped, the car won't start.” What?